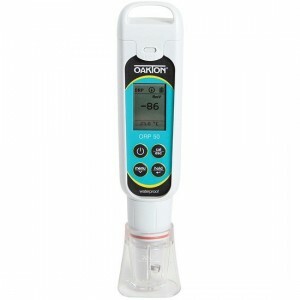 An ORP Tester is used to measure the ability of water to oxidize contaminants. Conveniently pocket-sized the Waterproof ORPTestr's® double junction electrode is ideal for organics, heavy metals, sulfides, and dirty water. The Tester offers 2mV accuracy and +/-200mV offset. The Valox® electrode housing is resistant to most chemicals. Applications for this instrument range from testing swimming pools to pulp bleaching.